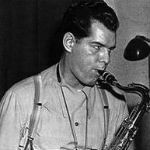 Tex Beneke (February 12, 1914 – May 30, 2000) was an American saxophonist, singer, and bandleader. Beneke started playing saxophone when he was nine, going from soprano to alto to tenor saxophones and staying with the latter. His first professional work was with bandleader Ben Young in 1935, but it was when he joined the Glenn Miller Orchestra three years later that his career hit its stride. Krupa knew that Glenn Miller was forming a band and recommended Beneke, and Miller immediately made Beneke his primary tenor sax soloist and Beneke played all but a few of the tenor solos on all of the records and personal appearances made by the Miller band until it disbanded in 1942. On the August 1, 1939, recording made of the Joe Garland composition “In The Mood”, Beneke trades two-measure tenor solo exchanges with his fellow section-mate Al Klink. In 1942, Glenn Miller’s orchestra won the first Gold Record ever awarded for “Chattanooga Choo Choo”; the song was written by Harry Warren and Mack Gordon as part of the score for the 1941 Twentieth Century Fox movie Sun Valley Serenade.